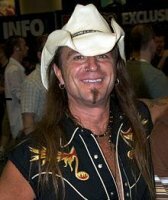 Scott McNeil hails from Vancouver, Canada by way of Brisbane, Australia. He started acting at the age of three and hasn't (his mom would say) stopped since. Spanning over two decades and including over 12,000 episodes, Scott's voice career began with The New Adventures of He-Man way back in (gasp) 1988. He is perhaps best known currently as Duo Maxwell in Gundam Wing, Koga, in Inuyasha, Piccolo (the first) and many others in Dragon Ball Z, Dinobot, Rattrap, Waspinator, and Silverbolt in Beast Wars, Jetfire in Transformers Armada, and Wolverine in X-Men: Evolution, As well as Hohenheim in Full Metal Alchemist, the deeply neurotic Merb Stork in StormHawks, the amazingly inept Voltar in League of Super Evil, Ali al Satchez in Gundam 00, and the inanely musical Flam in My Little Pony. This just in! Scott is now the voice of Durotan in World of Warcraft. Equally successful in film and television, Scott has starred in the feature films Sleeping with Strangers and Sleeping Dogs, and Scooby Doo II. He has guest starred on numerous television series and features, including The Flash, Falling Skies, Once Upon a Time, Psych, Primeval New World, Supernatural, Sanctuary, Highlander, The Outer Limits, Teenage Mutant Ninja Turtles, Beyond Belief, Beggars and Choosers, Stargate SG-1 and Disney's Ladies and the Champ, to name a few. This just in: Scott is currently working on a bunch of new roles, Including work in Riverdale as "Tall Boy", the live action Woody Woodpecker movie, Lego Elves: Secrets of Elvendale, Exchange Student Zero, The Deep, Max Steel, SuperNoobs, Johnny Test, L.O.S.E, Hero 108, 1001 Tales of the Arabian Nights ,Strawberry Shortcake, My Little Pony, Numerous Video Games and a number of *cough cough* “Top Secret” Anime Titles. Scott loves cartoons most of all because, "Hey, it's indoor work with no heavy lifting." When his busy schedule allows, he can be found playing his Level 100 Troll Warlock in World of Warcraft while eating spray cheese…..FOR THE HORDE!!! Never a charge, but we ask you to restrict your requests for autographs to 2 or 3 and keep your time with him brief in fairness to others and to keep him on schedule.